Home Kansas Community News Abilene Peter and the Starcatcher takes flight at GPT! Abilene, November 27 – You know the story of Wendy Darling and Peter Pan, of the dreaded Captain Hook and his loyal first mate Smee, of the native islanders and a fierce crocodile, or at least, you think you do. What if we told you there’s more to the story? How did Peter become Pan? Who is this insufferably bright Molly Aster? What is this starstuff everyone keeps talking about? Find out in Peter and the Starcatcher. December 1st through 10th at Great Plains Theatre. This play, based on the series written by Dave Barry and Ridley Pearson, will not only take you on a magical journey to a faraway island, but will have you laughing through the entire voyage! Sean McCall plays dreaded pirate captain Black Stache, the most fearsome and ruthless pirate to ever brandish a mustache. Opposite our savage swashbuckler is Layne Roate, playing a sad young boy who may not have a name, but that doesn’t mean he can’t do great things. Peter and the Starcatcher not only features a fun and imaginative story filled with lovable characters, but the production was created to be built before your eyes! Practical effects and weird instruments make up the wonder behind the action with music director Sarah Wussow and percussionist Michelle Chin playing instruments ranging from piano to marimba to saw toothed ruler to chains in a bucket! Creaking doors, swaying ships, a sweltering and exotic jungle, all of these and more are created with an eclectic array of instruments, careful timing, and just a pinch of magic. 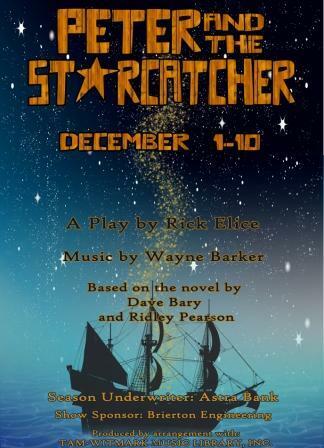 Don’t miss your opportunity to see Peter and the Starcatcher, a show sure to delight and mystify! Tickets are available online at greatplainstheatre.com, vie phone at 785-263-4574, or at the box office at 401 Cottage Ave, in Abilene.